A commercial cargo craft owned and operated by Orbital ATK wrapped up a two-day journey to the International Space Station on Tuesday, delivering ice cream and pizza for the lab’s six-person crew and hardware for a slew of research experiments, including CubeSats slated for orbital deployments in the coming weeks. Guided by GPS and laser navigation sensors, the Cygnus supply ship approached the space station from below, pausing at several pre-planned hold points for astronauts and ground controllers to check the progress of the rendezvous. After it reached a final hold point around 30 feet, or 10 meters, from the orbiting complex, astronaut Paolo Nespoli took control of the station’s 58-foot-long (17-meter) Canadian-built robotic arm to grapple the Cygnus spaceship at 5:04 a.m. EST (1004 GMT) as the vehicles sailed 260 miles (418 kilometers) over the southeastern Indian Ocean. Ground controllers commanded the robotic arm to place the Cygnus supply carrier on the Unity module’s Earth-facing berthing mechanism a few hours later. 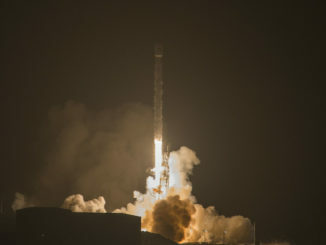 Sixteen bolts drove closed in four steps to firmly connect the newly-arrived cargo craft with the space station. 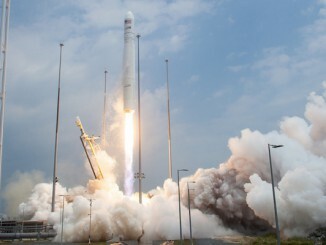 The automated arrival came two days after the Cygnus resupply vessel lifted off Sunday from a launch pad on Virginia’s Eastern Shore, riding an Orbital ATK Antares rocket into orbit to kick off its orbital pursuit of the space station. Astronauts opened hatches leading into the Cygnus’ pressurized cargo module later Tuesday, a day earlier than planned. Fresh fruit and vegetables are among the goodies riding inside a refrigerator on Cygnus spacecraft. “The crew is going to get some treats when they open up the hatch,” said Dan Hartman, NASA’s deputy space station program manager, before the launch. The station’s four astronauts living and working in the U.S. segment of the outpost will get to work on experiments carried in the Cygnus. For the first time, they will also relocate some research hardware already on the station into a rack inside the Cygnus cargo module, using the facility as a temporary research base. Among the scientific supplies delivered to the station Tuesday were gas bottles to support an advanced combustion microgravity experiment, a habitat for research rodents launching on a future mission, and items for a 3D printer aboard the orbiting laboratory, according to Camille Alleyne, associate space station program scientist at NASA’s Johnson Space Center in Houston. Two CubeSats will be transferred inside the space station to join three others for release into orbit through the Japanese lab module’s airlock. One of the CubeSats is named the E. Coli Antimicrobial Satellite, or EcAMSat, is about the size of a small briefcase. Developed by engineers at NASA’s Ames Research Center and scientists at Stanford University, EcAMSat will study the antibiotic resistance in space of E. coli, a bacterial pathogen responsible for urinary tract infection in humans and animals. EcAMSat’s mission is expected to last more than a year, and two types of E. coli cells — a wild and a mutant strain — contained in 48 microfluidic wells inside the CubeSat’s miniature laboratory will be activated, grown and tested once the 23-pound (10-kilogram) satellite is ejected from the station’s Japanese robotic arm, according to Stevan Spremo, EcAMSat’s project manager. “With this, we believe that we’ll learn more about antibiotic resistance in the microgravity environment, where E. coli are known to grow more virulently in space,” Spremo said. The results could help protect astronauts on future space missions and develop countermeasures that may be useful for humans on Earth, he said. The other small spacecraft carried on the OA-8 mission and destined for deployment through the Kibo airlock is TechEdSat 6, another experimental CubeSat from the Ames Research Center in partnership with San Jose State University and the University of Idaho. TechEdSat 6 is the latest in a series of CubeSats testing an “exo-brake” de-orbit system, a drag device that uses aerodynamic forces — and not propulsion — to re-enter the atmosphere. The technology could eventually allow some space station research samples to return to Earth sooner, and at less expense. Station astronauts will repack the Cygnus spacecraft’s Italian-built logistics module with trash before closing hatches and detaching the supply ship from the Unity module with the robotic arm Dec. 3. Mission control will maneuver the Cygnus a few feet from another berthing port on the station’s Harmony module, where crew capsules from Boeing and SpaceX are expected to dock once they are ready to begin flying astronauts into orbit. Engineers will use the Cygnus spacecraft to simulate the presence of a commercial crew craft at Harmony’s space-facing port and check to ensure it does not block GPS navigation signals from reaching the space station. 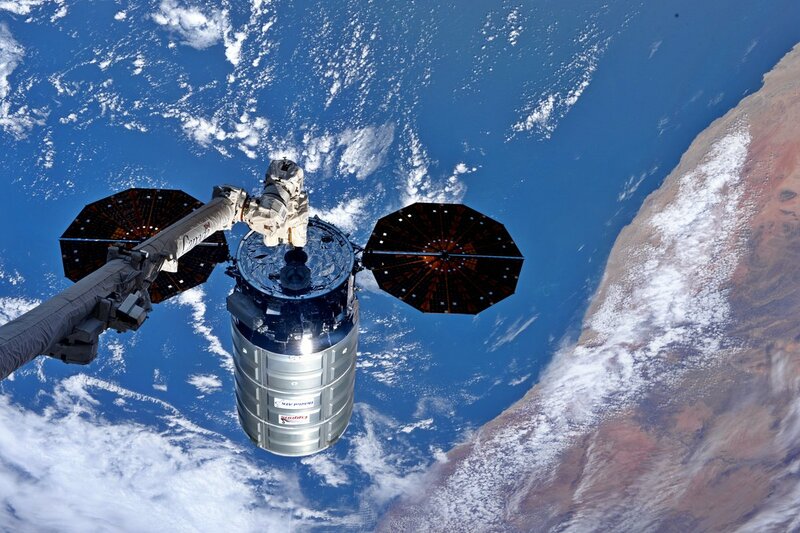 Once those tests are finished, the robotic arm will release Cygnus on Dec. 4, and Orbital ATK’s ground team will send commands to raise the ship’s orbit to an altitude of around 300 miles (500 kilometers). In that orbit, Cygnus will deploy 14 more CubeSats — ranging in size from a Rubik’s Cube to a loaf of bread — from an external device provided by NanoRacks, a Houston-based company that offers small satellite deployments on space station cargo flights. 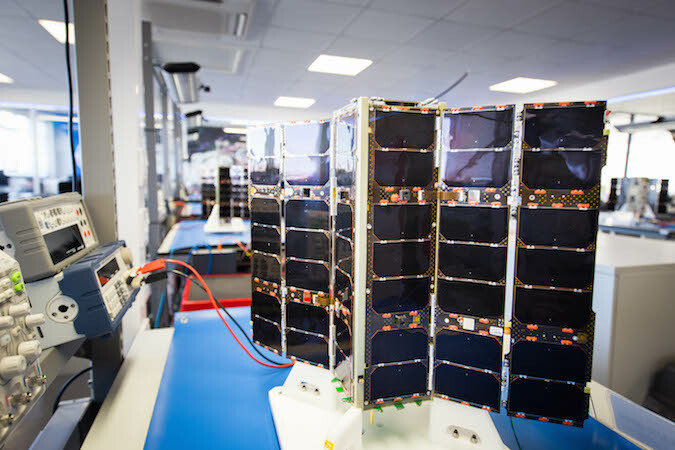 Eight of the CubeSats will join Spire Global’s commercial weather satellite network, which derives humidity and temperature profiles by measuring GPS navigation signals passing through Earth’s atmosphere. Two AeroCube satellites assembled by the Aerospace Corp. for NASA’s Optical Communications and Sensor Demonstration, or OCSD, mission will test high-speed laser communications and an innovative water-based propulsion system to maneuver in close proximity to one another. The ISARA CubeSat developed by the Jet Propulsion Laboratory will study the performance of an integrated solar array and radio antenna and a compact suite of three visible and infrared cameras that could be employed on future weather satellites. The Naval Postgraduate School’s PropCube 2 CubeSat is also slated for deployment from Cygnus in December to measure disturbances in the ionosphere, an upper layer of Earth’s atmosphere. The Cost-effective High E-Frequency Satellite, or CHEFSat, from the Naval Research Laboratory will help engineers gauge the performance of a consumer-grade radio frequency device in space. The first satellite for Asgardia, an organization that aims to become the first nation state in space, was also launched Sunday. The group was created by Igor Ashurbeyli, a Russian scientist, and the Asgardia 1 satellite hosts a 500-gigabyte solid state drive containing files and data uploaded by the organization’s supporters, or citizens. The Cygnus spacecraft will fall out of orbit in December after wrapping up the CubeSat deployments and burn up in the atmosphere over the South Pacific Ocean, discarding the space station’s trash and other unneeded items tagged for disposal by NASA. Orbital ATK is one of two NASA contractors with operational resupply vehicles for the space station. The space agency awarded contracts to Orbital ATK and SpaceX in 2008 to ferry cargo to the research lab after the retirement of the space shuttle. Orbital originally received a $1.9 billion contract for eight missions, a deal that was later extended to 11 flights. The current mission, known as OA-8, is the eighth flight in Orbital ATK’s cargo resupply contract. 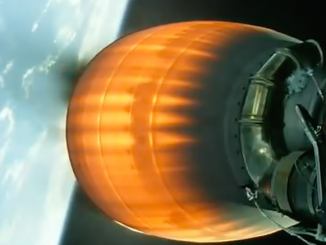 NASA awarded Orbital ATK, SpaceX and newcomer Sierra Nevada Corp. a new round resupply contracts in 2016, guaranteeing each company a minimum of six more cargo missions from 2019 through 2024. 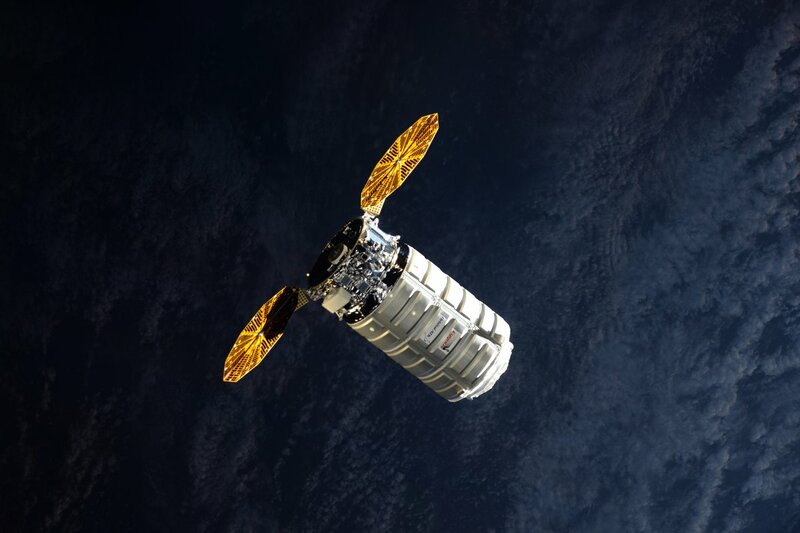 That bumps Orbital ATK’s backlog to at least nine more Cygnus resupply flights in the next seven years, most of which are expected to launch on the company’s own Antares booster from Virginia. Orbital ATK also has the option to launch Cygnus missions using United Launch Alliance Atlas 5 rockets.